TNR -- TV News and Reviews: Cake Boss Finale -- "Fireworks, Falling Fondant, & Fathers"
Cake Boss Finale -- "Fireworks, Falling Fondant, & Fathers"
Tonight on the season finale of Cake Boss, "Fireworks, Falling Fondant, & Fathers", Buddy and the Cake Boss crew made a spectacular cake, the crew had some fun with fireworks, and Buddy paid tribute to fathers. The client tonight was the Grucci family, whose fireworks company has put on spectacular displays for major New York holidays and events. They wanted a cake for the celebration of their late father's birthday, and hoped it would include some of the monuments they've lit up with fireworks in their business's lengthy career. Buddy was excited about creating a cake that the Gruccis would later add pyrotechnics to. Having recently honored his own father with a celebration, Buddy was happy to help another family remember where they came from and rejoice in their family success. Buddy came up with a cake of a miniature New York City, with the Statue of Liberty, Brooklyn Bridge, the Empire State building, and even Carlo's Bakery. This cake went the distance! Once the fun and mayhem were over, the Cake Boss crew got to work. The skyscrapers were going to be 4-5 feet tall, which took a lot of cake. Daniella made the Statue of Liberty out of rice crispy treats covered in green fondant. The Cake Boss crew used plastic forms to press brick shapes into the fondant, as well as paint little windows in a perfect grid pattern. It's always a joy to watch Buddy and the Cake Boss crew with all their clever creations that make each detail so realistic. My favorites were the stadium decorated with multi-colored round sprinkles inside to simulate the dotted blur of a crowd inside, as well as the black fondant covered in a layer of poppyseeds for the building roofs. 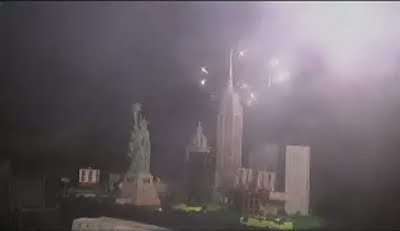 Buddy's favorite part of the scene was a mini-replica of Mr. Grucci, sitting at the foot of the Statue of Liberty with a little wire, ready to detonate some fireworks. I'll let the pictures speak for themselves, showing you the magnificent masterpiece the Cake Boss crew put together for the Grucci family celebration. Buddy went with his son to Take Your Dad to School Day, and brought mini cakes for all the kids to decorate with their dads. Buddy also shared a pic of him with his own father in the bakery. Cake Boss went through a short montage of the highlights of the past season, with the incredible cake creations and occasioinal mishaps that come out of Carlo's family bakery. It's been a fun and exciting journey with Buddy and the Cake Boss crew, and I'm looking forward to more fancy fireworks in the upcoming season. PHOTOS: Buddy Valastro, Frank Amato, and Tony "Tone Tone" Albanese working on the skyscraper cake, c2009 Libby Klein, TLC. Screencaps of "Fireworks, Falling Fondant, & Fathers", Cake Boss, c2009 TLC. Very nice! I love Cake Boss and their work is amazing! Keep it up Buddy and crew! Your cakes get better every episode!!! Well, I'm back again to leave another comment. About a week ago, Buddy, I jumped your case big time for your loud obnoxious mouth and your belittlement of your family in front of the cameras. Even though I still feel the same way about the way you act, who am I to chew you out? Just a dissatisfied viewer. I apologize for my comments and try to be kinder to your family. It goes a long way. You are very talented and I would watch your shows but I can't stand the yelling. Anybody know the price of that cake? I can't find it anywhere. How much did that cost!! !